Tourist railroads all across the U.S. and Canada are benefitting from the commercialization of Christmas (okay, let's not open all the negatives of that can of worms and focus on the positive) and that means Santa Claus trains or something similar are a huge part of a railroad's bottom line. And for the railroads that rely on steam, that means steam operations at night. And for the railroad photographer, that opens up a lot of photo possibilites (see, I told you we'd get to the positive). 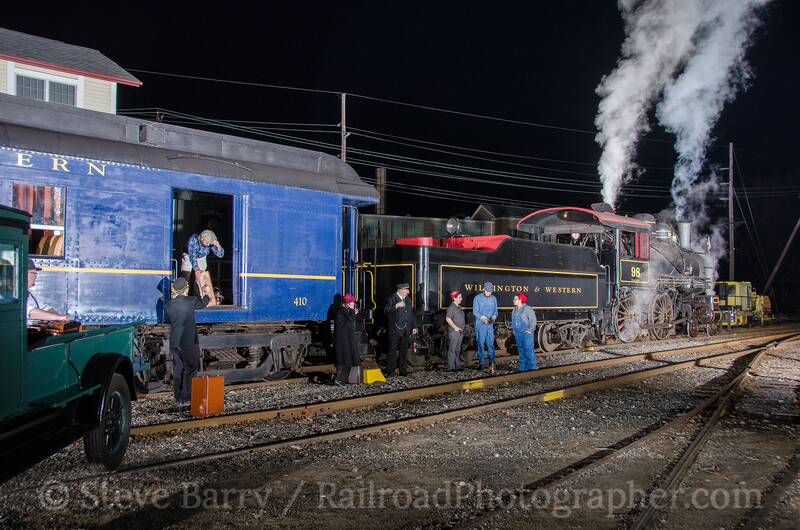 I had the chance to photograph three steam operations in three adjacent states -- all on one weekend. 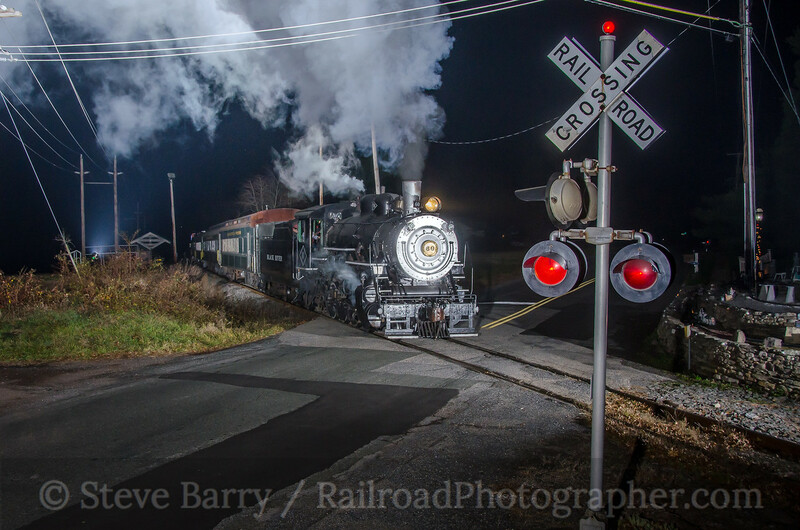 The Strasburg Rail Road in Pennsylvania operates one "The Night Before Christmas" train each Friday evening in December. 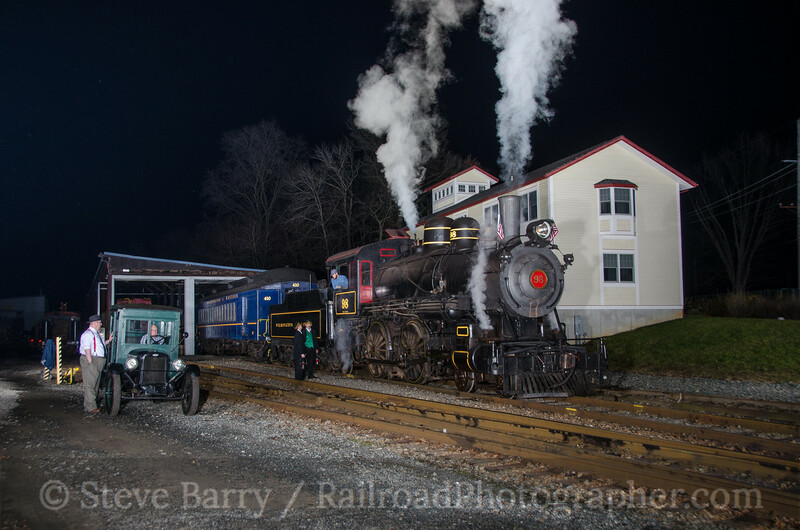 The Wilmington & Western in Delaware doesn't run night steam powered trains, but its locomotive is necessary to keep the steam-heated coaches on the daytime trains warm, and that means the locomotive is fired up over the weekend. And the Black River & Western runs several "The North Pole Express" trains each Saturday and Sunday in December, including one departure each day after dark. Let the photography begin! 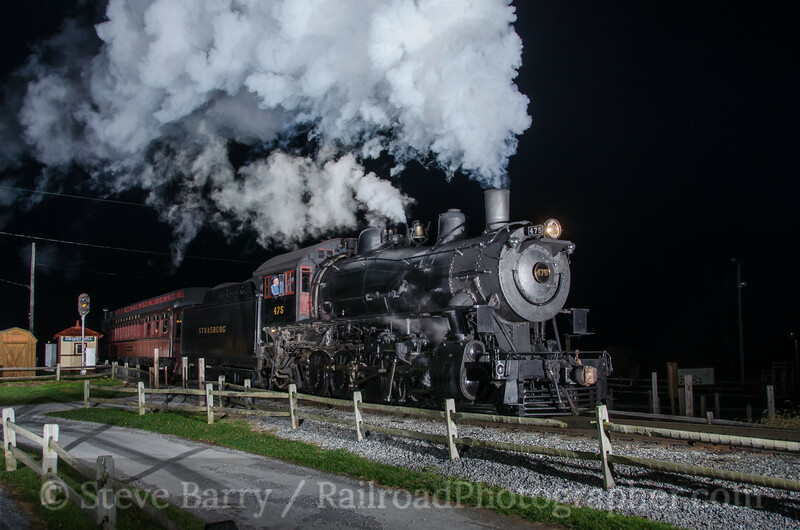 The Strasburg Rail Road only operates one train a night on one day a week, so that meant I needed to make more than one trip to Lancaster County. On Friday, December 4, I photographed the train (above) as it passed through Cherry Hill (the sign on the station says "Population 17 More or Less;" the onboard narration explains that it's more when the train gets there and less when the train leaves, although the popularity of the corn maze Cherry Crest Farm keeps the population pretty high in the fall). This was actually my second choice of where to shoot that night, as I had wanted to do the shelter at the railroad's picnic area at Groff's Grove; alas, winter track work had the area around Groff's all torn up. The next weekend I had a three-railroad strategy all in place. Friday found me back at the Strasburg for the prime shot on the railroad -- the bridge over Pumpkinville Turnpike (actually a dirt farm lane) near Paradise. I checked in with the landowner during the day and got permission to be on his property, and began my set-up at about 6:30. Like the previous week, the power was Strasburg's ex-Norfolk & Western 4-8-0 pulling a monster 11-car train. The engine runs tender-first on the outbound trip, giving me a chance to test my flashes and set-up. On the return to Strasburg, No. 475 put on quite a show climbing the grade out of Paradise. As it crossed the bridge I fired the shot and had the first steam locomotive of the week in the bag. Wilmington & Western's ex-Mississippi Central 4-4-0 No. 98 was next on the list, scheduled for Saturday night. The locomotive has a mechanical issue that keeps it from moving under its own power, but the railroad needs the steam it produces to charge the steam lines in the coaches for its daytime runs. With No. 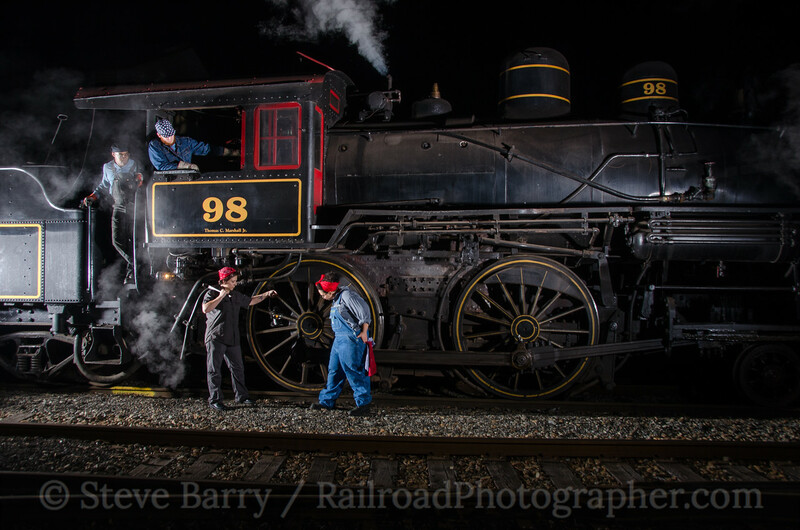 98 needed to provide steam on Saturday and Sunday, it would be hot overnight on Saturday, so the railroad scheduled a night photography event. Volunteer Tommy Gears rounded up antique trucks and actors and it created quite the scene. The shoot took place at the W&W's shop in Marshallton. A second view shows the combine loading, a passenger boarding, and the railroad crew chatting. With the wide shots out of the way, we moved in closer for some detailed shots. The locomotive crew looks on as some female workers tend to the 4-4-0. During World War II it was not uncommon to find women working in rail yards while many men were away. 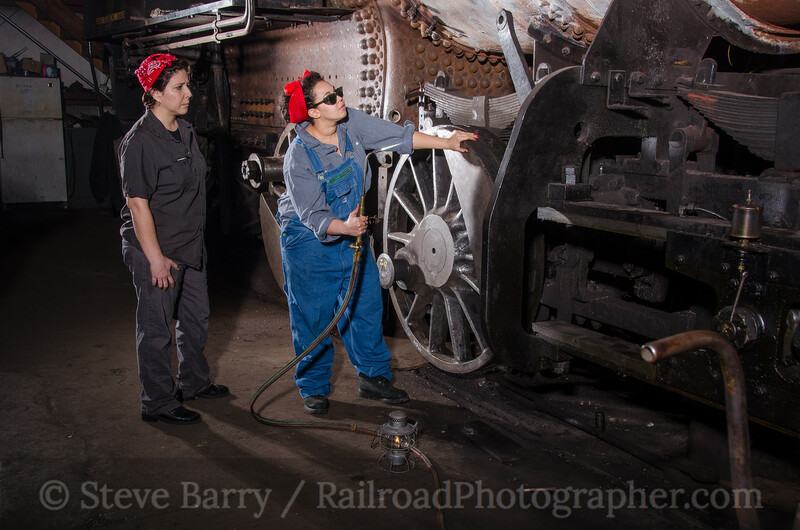 With the women decked out in their railroad worker attire, we retreated into the railroad's shop for some more "Rosie the Riveter" scenes using an under-restoration 0-6-0 as a backdrop. That brings us to Sunday night. Black River & Western has "The North Pole Express" running throughout the day on Saturday and Sunday, but three moves are done after dark. The 5:00 train leaves Flemington for the North Pole (actually, Ringoes where the railroad's shop is located). It then departs the North Pole at 7:00 to head back to Flemington, although the locomotive runs tender-first, making the shot less than desirable. Finally, the empty train deadheads from Flemington back to Ringoes sometime after 7:30. 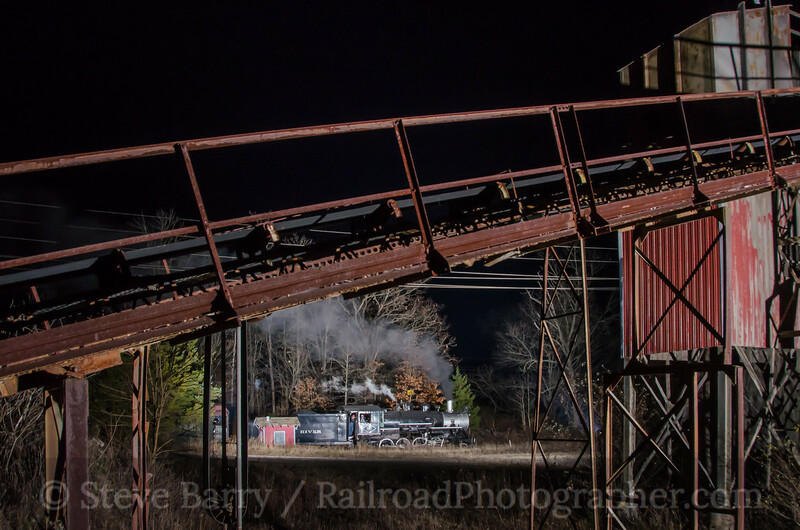 I had done some static night photography with a diesel at the abandoned Hunterdon Concrete plant just outside Ringoes, and set up there for a non-static steam shot on December 13. Black River & Western uses an ex-Great Western 2-8-0 that used to haul sugar beets in Colorado. When doing night photography, you really need a "prop" of some sort so you don't have just the train peeking out of the darkness. The Black River & Western is not loaded with props -- a couple of nice bridges are either hard to access or blocked by trees -- so you have to improvise. For the 7:30 deadhead move I wound up at Toad Lane, once again just outside Ringoes, where a convenient grassy knoll gave me some elevation for a shot coming across the grade crossing. 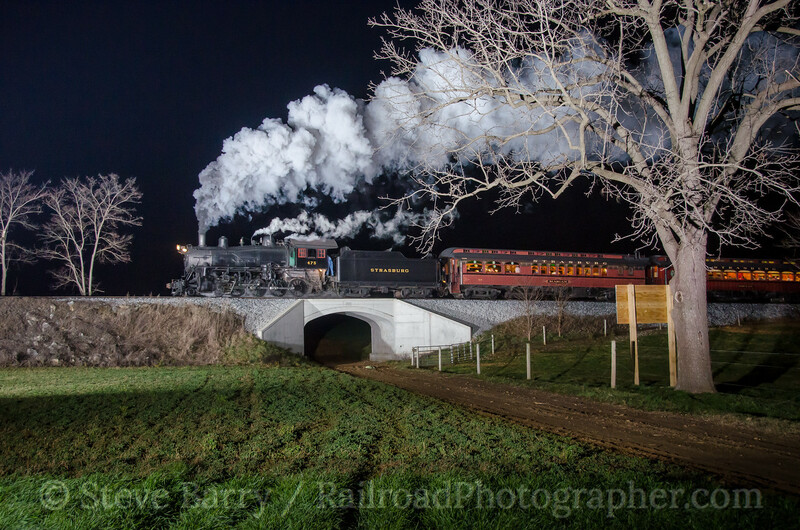 With only one weekend left before Christmas, I may not get many more opportunities to shoot steam at night this year. But I have enjoyed getting some fun images this year!